When you think about remodeling your Naples-area kitchen, you probably think about actually using your kitchen to cook, entertain and hang out. You’re likely not envisioning the sawdust and the disruption that’s part of the process. That’s why most of the clients we work with are curious to know just how long it will take before they can actually use their kitchen again. We really do understand your concern, but there’s not always a simple, one-size-fits-all answer to that question. It’s a bit like asking, “How long will it take me to get to my vacation destination?” The answer depends on where you’re going and how you want to get there. 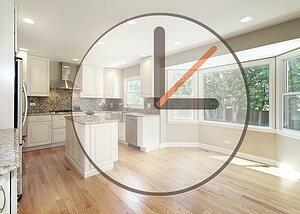 So what factors influence how long your kitchen remodel will take? Here are a few to consider. Scope: How big of a change are you planning to make? If what you have in mind is simply replacing fixtures in your bathroom or resurfacing cabinets in your kitchen, that probably won’t take terribly long once you decide on the finishes and make your selections. If you’re changing the layout of either room, it’s going to take considerably longer—especially if there is deconstruction involved. Multiple room remodeling projects obviously take longer than a single room. Complexity: Of course, the size of the project isn’t the only thing that impacts the schedule. If you’re making structural changes (moving a wall or changing the location of a door or window or staircase), that’s going to involve careful planning and even engineering. Code Compliance: Building codes are constantly being amended. If you live in an older home, you may be “out of code,” but not be impacted because your house is “grandfathered” into compliance. If you make significant changes, however, there may by electrical, plumbing or structural codes you must adhere to. That can take a bit of time. You’ll notice I haven’t given a specific timetable for a “typical” remodeling project. That’s because every project is unique. The best way to get an estimate in terms of timeline is to schedule a free consultation and talk through the specifics of what you want to have done. Once you and your remodeler understand exactly what’s required, you can get an approximate timeline for the completion of your project. One advantage of dealing with a design/build remodeler is that the designers have worked with their builder colleagues for years. Since they’ve worked together as a team on multiple projects before, once they know exactly what you want and have come up with a plan, they’ll have a pretty accurate idea of how long it will take to deliver on your plans.